Really, a deal on Ben and Jerrys. It's always on offer s it cycles round the supermarkets. It's almost as guaranteed as Half price Pringles, 50p Frijj Milk and a Sale at DFS. Not having a go at you OP, voted hot, the retailers are just getting on my goat recently. Also £2.50 at Asda currently. Yes, i did see that, but i have no idea where there is a Farm Foods. I just buy from where's easiest to get to (Farmfoods is a bit of a trek for me too - but there's one in my sister's area). I've tried a few of the copies (Tesco, Lidl, Aldi) - the one I like best is the Lidl (Gelatelli) one - though we didn't get off to the best start. First tub I bought had ONE cookie dough piece in it! That's a quick ban for quite an innocuous comment. Ben and Jerry's are usually £2.50 in Sainsburys. The Lidl one is definitely worth a try, that's the one that impressed me most as a close dupe of Ben And Jerry's. I assume Lidl have it on offer now and then - I've only just discovered it. Really, a deal on Ben and Jerrys. It's always on offer s it cycles round …Really, a deal on Ben and Jerrys. It's always on offer s it cycles round the supermarkets.It's almost as guaranteed as Half price Pringles, 50p Frijj Milk and a Sale at DFS.Not having a go at you OP, voted hot, the retailers are just getting on my goat recently. Why's it rising up out of the tub? Not sure if I would trust that. They already have that flavour. At least in the Netherlands they do. Not sure if they sell it here in the UK. how do they get the lid on the pot given that it contains more ice cream than the container has volume? surely the makers are not using fake photos? 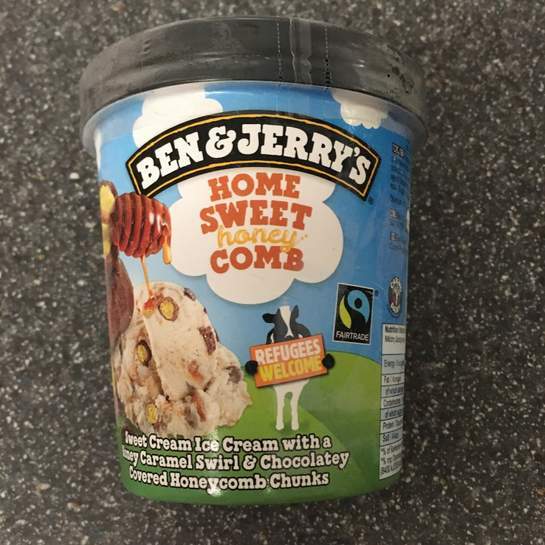 The Lidl one is definitely worth a try, that's the one that impressed me …The Lidl one is definitely worth a try, that's the one that impressed me most as a close dupe of Ben And Jerry's. I assume Lidl have it on offer now and then - I've only just discovered it. Look out for exclusive collectible tubs with "refugees welcome"! Sad. how do they get the lid on the pot given that it contains more ice cream …how do they get the lid on the pot given that it contains more ice cream than the container has volume?surely the makers are not using fake photos? They already have that flavour. At least in the Netherlands they do. Not …They already have that flavour. At least in the Netherlands they do. Not sure if they sell it here in the UK.